I’ve been accruing posts for some time now, and although at the time, the dish below was completely unknown to me, I’ve finally figured it out. My experiences, below. There are times when I go to a particular restaurant and encounter a new, uncharted (at least for me) species of food, devour it, and sit back, completely ignorant to what I just ingested. Sad thing is, this happens multiple times, especially if I’m unfamiliar with the ethnicity of the dish (usually I ask, “What is this? and when I receive a half-believable answer, I give a half-hearted shrug, and dig in). In my brain, it simply just registers as a [insert color]ish thing that’s shaped like a [insert cloud shape], or otherwise known as number something on the main course menu. Pretty un-foodie, if you’d ask me. I’m much better about it now. In this particular case, this happened at an all you can eat Korean barbecue place in Korea town (surprise) of Los Angeles. It wasn’t a particular cut of meat or anything– hell it wasn’t even a “main course;” it was one of those small little side dishes (banchan). On that particular day, it was a greenish leafy dish that resembled a lot like spinach…lightly marinated with some kind of sauce. All I know was that it was amazingly delicious, and I ate about a pound of it. I think the waiter was getting increasingly cross since I inhaled it at abnormally high speeds. I mean, I’ve heard of getting your money’s worth at all you can eat restaurants, but one usually succeeds in getting their worth by eating 50 pounds of prime rib, not 89 two-ounce servings of marinated vegetable greens. Funny, I would think it difficult for a restaurant to go broke serving greens and using too much dish detergent to clean your plates. 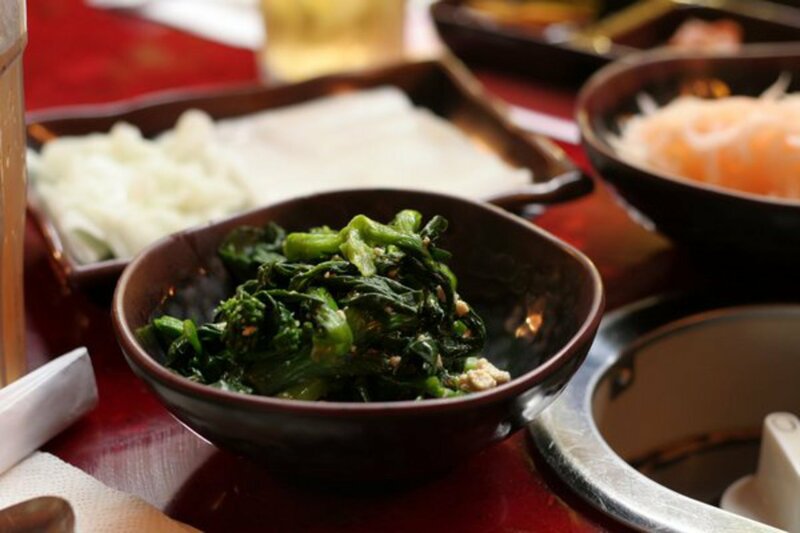 Anyway, I eventually did some intensive Korean market searching with my trusted friend and found out that the dish was called Yuchae namul, and was indeed, some derivative of spinach (I believe it was the sprouts of snow pea leaves), dressed with sesame oil, green onion, and sesame seeds. Wonderful. And it only took me a month to find that out. The texture of the leaves were a slight level below crunchy, which probably is the result of the blanching and cooling process. Blanching or “thrown quickly in boiling water” (for about 30 seconds) rapidly degrades the celluose and indigestible cell walls of plant matter, hence, yielding tender green but not limpy olive vegetables. Pleasing to the eye, and to the palate, as the plant chlorphylls are retained. Any longer in boiling water, and the chlorophyll of plant would convert, yielding that ugly, poop-green color. I guess that’s the science lesson of the day. Don’t forget to explore and ask about what you’re actually eating once in a while. Waiters are there to serve you, let you have a good time, but do not be afraid to assault him or her with questions about your food.